Did you have a merry Christmas? A happy season? A delightful Festivus? As usual, I had too much to do and not enough time in between them. A lot of driving around, and few days in which I do not have a responsibility to be somewhere. Work is pretty heavy, and that's good for the store, but it takes a bit of a toll on me. The writing has fallen by the wayside, and tomorrow I head down to Massachusetts to be with friends. We'll see how much writing I'll get done. But rather than concentrate on the negative, I'll put up some of my stranger Christmas traditions. Every year, for example, we go to the World's Best Grinder place and get an awesome grinder. Those of you who do not live in the New England area may not realize that a sub is a grinder in these parts. Dunno why. But the important thing to realize is that the sandwiches made by Elmwood Pizza are without a doubt the best in the world. I don't know why. It may be the Polish tradition that adds a special mix of spices to the oil. All I know is that their grinders are incredibly savory. The meat is acceptable, the veggies nothing to crow about. But every cold grinder we have gotten there has been a treasure. The Queen of Science and I get one every Christmas (I put a six incher in her stocking one year. The smell of it permeated the car and gave me away), and they are as excellent as we remember. For me, it's a little treat that's the taste of Christmas. My relationship with certain media franchises can best be described as a romantic one. Certain things I just fall in love with: Godzilla, the undead, Klingons, Fallout, the Diskworld, Ancient Egypt, Cthulhu, Wing Commander, and many others. Some stay. Godzilla, for example, is something I can return to many times a year with complete enjoyment. Every now and then, however, I fall out of love. Something switches, either in me, or the franchise, and it loses its luster. It happened a few years ago with Chelsea Quinn Yarbro's Le Comte Saint Germain, I'm sad to say. I'll always look back on those books with fondness, but I don't think I'll ever read a new one. It's kind of sad, because it's a part of my life that I enjoyed, and now am leaving behind me. Over the last two months, I've fallen out of love with Warmachine. Which is a pity. I played the game pretty much on a weekly basis for two years, and spent a lot of time painting up my little miniature army. I like the painting, but the game has evolved into something that is unbalanced. It has become frustrating to play. Much as I hoped Mark 2 would fix the problems that annoyed me, the game still had problems which made it unplayable for me. The sad part is, the loss of me has resulted in the implosion of Warmachine in Bennington. I was the guy who started off Warmachine, and it appears that without me, there isn't enough interest to sustain itself. Partially I feel guilty because this means the store has a lot of stock that is going to just sit on its shelves. And I don't get to socialize with some of the Warmachine players anymore. I've started a mini painting night, and that's providing me with a good hour and a half of serenity, the aspect of the hobby I enjoyed most. What am I painting, you ask? 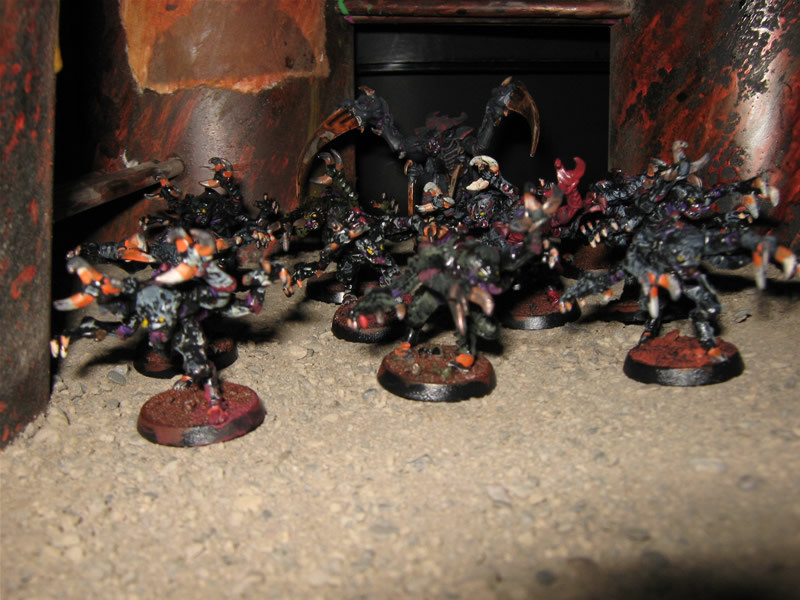 Tyranids from Warhammer 40K. And yes, I can already see the signs of love. I bought the older Tyranid books in order to have a sense of their history. I've even bought a novel that involves them, but in my defense, I know the author. So, the job search is going into heavy drive, so I don't have the time I would like to devote to this blog, or writing in general, anymore. And it's the Christmas season, so there's a lot of extra scurrying around buying stuff and being secretive and mailing stuff. Plus I've added another work day at the Grotto. Once I'm done with the revisions to "N is for Neville" and "Between Two Living Gods" I will be getting back to Hag. I will thus be having less closure on my writing for the next three months. This is, I think, going to be a couple of difficult months.